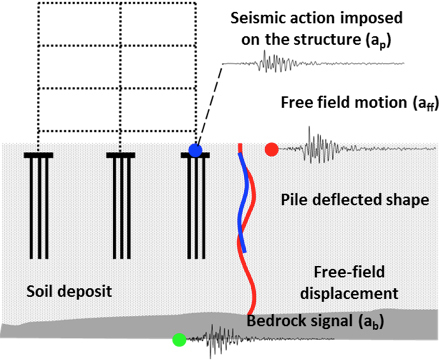 Seismic analysis of structures supported on piles is conventionally performed by considering the free-field motion as the base excitation. In this regard, possible piles-induced modification of the seismic motion due to the interplay between soil and piles, which is referred to as kinematic soil-pile interaction, is neglected. However, piles, depending on their stiffness, are not always able to follow motions with short wavelengths induced by the surrounding soil. As a result, piles may filter the high-frequency components of the free-field motion and may, thus, modify the input motion of a pile-supported structure. The above physical phenomenon which is referred to as “filtering effect” may be particularly pronounced for soft soils, where piles represent the most common design option. Experimental evidence on this filtering action of piles is still limited to some instrumented pile-supported buildings in Japan. These experimental data clearly indicate that piles filter out the high frequency component of the free-field motion. However, the above acceleration recordings at the foundation of these buildings include inherently the effect of the superstructure oscillation. Thus, there is a la lack of experimental evidence on the alteration of seismic motion that can be attributed exclusively to piles. COSMO research project aims to advance the present state-of-the-art on the above critical issue of piles-induced filtering effect. For this reason, a series of centrifuge tests are proposed on models of aluminum piles embedded in soft soils. The proposed model tests include both single piles and groups of three piles rigidly connected by a cap at different pile spacing under harmonic and transient excitations. The influence of soil-cap contact and cap-embedment on the alteration of seismic motion will be also investigated.